Engraving of the lake of Pushkar in Rajasthan, by Edward Francis Finden (1791-1857) and Patrick Young Waugh (1788-1829). Plate 19 of James Tod's 'Annals and antiquities of Rajasth'an or the Central and Western Rajpoot States of India' published in London in 1829. 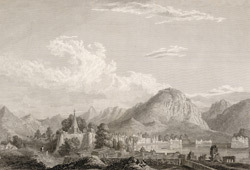 In 1818 Mewar and other princely states signed a treaty with the British and Colonel James Tod became the first Political Agent to the Western Rajput States. Along with his official duties, Tod became very interested in the genealogies of the Rajput Kingdoms as well as the art they produced. Pushkar is a small town near Ajmer built around a sacred lake of the same name. The lake is surrounded by stone steps leading to bathing ghats and shrines. The holiest temple in the town dates to the 17th century and is dedicated to Brahma. As one of the few Brahma temples in the world, it is believed that he personally chose the site at Pushkar.